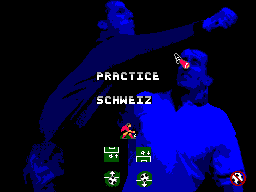 At first this appears to be a nice attempt at a football (soccer) game on a system with just two action buttons. 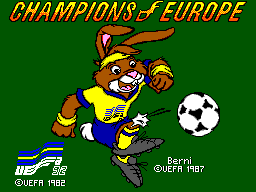 Made in conjunction with the 1992 European Championships in Sweden and even featuring the mascot that adorned the tournament's merchandise, Berni the bunny, you have the choice to play as any team from Europe at the time (a lot has changed since then though). Choose from practice, demo, exhibition or tournament matches in 1 player or 2 player mode. The length of each football match can be changed from 3, 5, 8 or 10 minutes per half and there are a host of other options, including after-touch, wind strength and weather conditions. All of the necessary options for a good football game appear to be present. The tournament itself is based around the UEFA Championship, starting with a set of qualifying leagues before moving into the knock-out stages. It isn't just the teams that featured in Euro '92 can be picked; every country eligible for the tournament is in the game, shown way of a map of Europe. Unfortunately the map where you select the teams is poor. It isn't due to the Master Systems graphical limitations either, it's just badly drawn and out of proportion. The names of the countries are all in their own languages too, so unless you have good geographical knowledge of Europe in the early 90's you'll find it a challenge just knowing which team you picked, mostly where Eastern Europe is concerned. This wasn't an issue upon release, but nowadays it is. Gameplay is extremely hampered by the lack of control you have over the players and the ball, but more about that later. The AI of the computer controlled teams is just as hapless, they all run around aimlessly which just makes their actions too confusing to react to and deal with. The view of the pitch is a top-down one, leaving you with sight of only your immediate surroundings, also of little use in a sport that relies on awareness of the other areas of the pitch and of who is positioned where. Your awareness of where other players are on the pitch is extremely limited, there is a radar but because play moves so fast and you need all of your concentration on the ball you don't have time to even glance at the radar, making it redundant. Even if you could look at it once in a while, the dots representing your players are almost indistinguishable from those of the opposite team. There also appears to be no difference between each team's abilities at all, no statistics that affect play and very few options in play besides run and kick. Oh you can add after-touch to the ball, but kicking the ball in a straight line is as likely to achieve a goal as using after-touch since the goal keepers are slow and their movements very limited. This brings me to another flaw - penalty taking. There are some glitches in this section of the game which make taking penalties a rather random affair, not least of which is the ball sometimes going in the opposite direction of where you want it to. On occasion the ball will pass right through the goalkeeper. The game does look especially nice though, with crisp sprites and presentation. In fact the presentation is very well done, everything is clearly set out (aside from that map) and the intro screen is possibly the best thing about the game. The option screens are nicely done and even on the pitch there are some nice touches, the best being speech bubbles from players' and referees' mouths at times, get fouled to see a censored expletive or a brisk "ouch!". The pitch looks good and the grass around goal-mouth even shows some wear. I can't fault this aspect of the game at all, the graphics or the animation. There's only one tune in the game, it plays during an admittedly nice intro animation with Berni showing off some quick ball skills, but that's all you get. The sound effects are also sparse, just the required effects when kicking the ball and the 'peep' of the referee's whistle. I can't add any more to that, there really is that little in the way of sound in the game. Some crowd noise would have been nice, or music playing during the game set-up screen. The major let down throughout the game is how poorly you're able to control the ball, Button 1 is used for tackling and passing with used Button 2 for shooting, and passing is a nightmare. As mentioned earlier, knowing what's happening on the pitch around you is no easy thing. This wouldn't even be so much of a problem if only the players had some control over the ball. As it is, the only time you can keep possession for long is when you want to run in a straight line and the ball is conveniently already in front of you. Otherwise you have to manoeuvre around it without touching it until you are facing the right way, because one slight touch before then will send it off in some unwanted direction. No ball control at all, none. There isn't a more important aspect to football games than this. The poor controls and bad computer AI cancel each other out, so the game isn't too difficult. Still, find another game if you want the ability to change direction while running with the ball and actually keep it in your possession more than half of the time. Very little replay value. The tournament is a challenge but without the ability to save your game you'll need a lot of patience to sit through it all in one sitting. It could have been great - Champions of Europe had an official license and looked very good - but there's no fun here and no challenge worth persevering for. It fails on the essentials.. running with and kicking the ball.